And the food is delicious. Doug’s serves up a classic café style breakfast complete with table service Monday through Friday until 11:00 a.m., and on weekends until 11:30 a.m. For the lunch and dinner crowd, the restaurant switches to a faster-food style using fresh ingredients, with a drive through window, and sit-down or take-out dining options. According to Freinwald, the most popular item on the menu is the Burger Den special, a mouthwatering ½ pound burger with cheese and bacon. Personally, I love their authentic Philly Cheesesteak sandwich, smothered in mushrooms. For my kids, the flavor-burst ice cream cones are a unique treat. But there’s more to this story than what’s on the menu. Doug’s Burger Den is truly a family business. 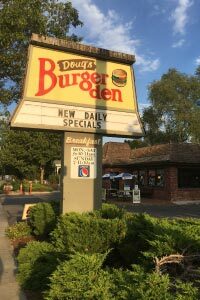 Doug is the son of Jim Corta, who started the original Burger Den in Middleton (there’s another one in New Plymouth). Doug opened the Eagle location in 1993, making it one of the longest continually operating restaurants in the community. 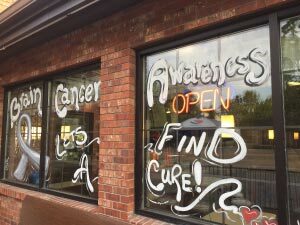 And on the outside of the restaurant, in bright and cheery paint, you’ll read a message about brain cancer. 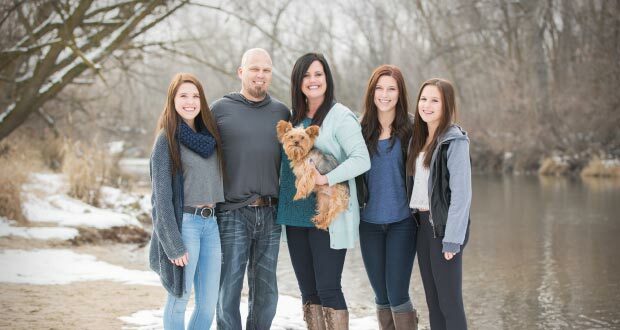 Doug was diagnosed in March 2014 when he went to the St. Luke’s emergency room with a severe migraine. According to Doug’s wife, Jacki, the doctors wanted to rule out the possibility of anything serious, so they ordered a CT scan. “I should have known when two doctors and the nurse come in together, they are not telling me he is ready to go home and all is fine!,” she wrote on her Caring Bridge site, where friends and family can follow Doug’s journey and make donations to assist with costs. Doug has been battling brain cancer ever since. He had his first brain surgery here in Boise, followed by chemotherapy and radiation. But the tumor returned, and Doug learned he would have just a few short months to live if he didn’t take immediate action. He found a new doctor in Seattle, followed again by targeted radiation and chemotherapy. He also got a taste of hope. Doug found out he was a candidate for a new clinical trial. The Nativis Voyager headbands are noninvasive medical devices that use radio frequency energy to disrupt cancer cell division. Doug wears the thin blue headband 24 hour per day. “Nativis Voyager is a potentially revolutionary cancer therapy,” said Dr. Charles Cobbs, MD, Medical Director of the The Ben & Catherine Ivy Center for Advanced Brain Tumor Treatment, located in Seattle where Doug travels for his treatments. On August 6, after Doug’s 18th round of chemotherapy, Jacki told me that his most recent MRI showed that the tumor was stable, which means it’s not growing, but he is still not in remission, so the fight continues. Since Doug got sick, Jacki has kept the family business and Eagle community staple running. Doug is also the Eagle High School Varsity Softball head coach. His team posted an impressive season record of 30-1, won the State championship, and Doug was named Coach of the Year. 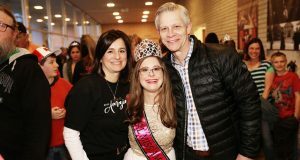 Through it all, Jacki and Doug have maintained a positive, winning attitude, supported by their family, by their many friends, and by their faith. “We take every victory with grace,” Jacki said. If you would like more information on how to help Doug and his family, you can follow Corta’s Caring Clan on Facebook, or visit www.caringbridge.org, where Jacki posts regular updates for Doug’s many fans.